The Shield: Did you have a moment when you knew USI would be your choice school? Hammonds: No, I wasn’t going to go to college when I first started, and then my grandfather said, “Oh no, you’re going to college.” Head coach was at Reitz when I first started throwing and stuff and he said something to me about joining the team. I was like, well, since my grandfather told me I’m going to college, looks like I will have something to do rather than just go to school. It would be kind of boring to just go to school and not have anything to do. So that’s where all that started. The Shield: So was that conversation with coach what made you choose throwing in college? Hammonds: My grandfather was the one who really said, “You need to go to college for sports.” I wanted to go to college for wrestling, but I was going to have to go to Lindsey Wilson College (in Columbia, Kentucky). I did love throwing and I wanted to stay close to my family, so I picked throwing and I came here. Coach Buckler was here at first, but now he’s gone. After I picked up throwing, I really made it a point to be the best in whatever I did in sports. The Shield: You set records as a freshman and as a sophomore. Did you expect that success or did it surprise you? Hammonds: Not really. I set goals and the goals that I set I achieve. Even if I don’t achieve it (right away), eventually I will. Once I set a goal, I want to achieve it. Just like in high school, I set a goal to get to state. My very last semester my senior year, I made state in track. The Shield: Do you find differences between throwing at Reitz and throwing in college? Hammonds: I didn’t have a coach, actually, in high school. I did have a guy who would come and help me; he actually passed away this week. He was a really funny and nice guy. I really liked him. He actually owns the records in Evansville for shot. He was my coach, but he couldn’t make it to a lot of meets because of his health issues. Coming here, at first it was hard because I had a coach. I had a hard time having a coach because I had coached myself for most of my life in throwing. Whenever I had a coach, he would tell me a lot of things to do. It was helpful, yet unhelpful, because it was hard for me to switch to that mode. Now that he is gone, it is kind of my own motivation and how I push myself. I like it a lot better. The Shield: Coach Mike Hillyard said that you guys are doing well as a self-taught group. Do you find it easier? Hammonds: I don’t know if the other athletes do, but I did. The other athletes really adored coach and really loved having a coach. I don’t know their past as having coaches or anything, but I never had one really. So that was really hard for me to start with a coach. But motivation wise, I like having my own time. I’m not a professional athlete, but I feel like as a professional athlete, they push themselves. That’s where I want to go, so I start young and practice. The Shield: Sports related or not, is there something you really enjoy at USI? Hammonds: I’m enjoying the freedom. I didn’t know this, but USI has a lot. I love the fact that I can be on campus all the time. I love being on campus, I go in the library all the time. I have actually picked up on making music, like making beats and singing. The (Liberal Arts Center) has a music room. My parent’s say I live on campus all the time. I just love that it’s an open campus all the time. The Shield: Graduation is still in the future, but is there anything you already have planned for after you graduate? Hammonds: Actually, as of right now, I started my own business. I do marketing for companies like Nike, Under Armour and Nutrilite. Then I see myself being a national champion in the weight throw and shot put, and pushing myself professionally in that and (in) the business that I talked about. 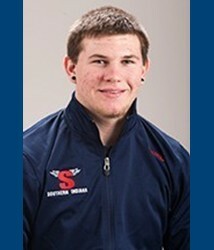 There is also opportunity at USI to be a throws coach. I would love to be a coach here. Sarah Loesch is a senior journalism major with a Spanish minor.